After quitting my job in 2014, I realized that a smaller paycheque would require a shift in my spending habits. I resolved to simply “spend less,” but did not create a new financial plan. My notion of mindful budgeting involved fewer lattes and bringing a brown-bag lunch more often. What I failed to do was look at my numbers in any kind of meaningful way and decide how they would impact my life. The truth is that the kind of scrutiny that’s key to budgeting is a skill, and it’s not a skill that I was ever taught. As a child, allowance meant money in for chores, money out at the candy store. In my 20s, a paycheque meant money in from my job, money out for a Saturday night. In my 30s, I’m suddenly thinking about retirement savings and kicking myself for how much I could have been saving if I’d seen the value in it. As I get older and set new goals for myself, it’s becoming quickly apparent how intrinsically linked my finances are with what I value in life. Going back to school, buying a home, travelling, and saving for my later years aren’t things I can put off or cross my fingers and simply hope for the best. When my Opa immigrated to Canada from Czechoslovakia in the early 1950s, he worked tirelessly and saved every last cent to bring my Oma here so they could build a life together. He intimately knew the value of every dollar he earned. When I was a little girl, I remember the one word my Opa detested was “only.” Every commercial on TV or ad in the newspaper stated that their product or service was a bargain at “only” $3.99 or $399.00 or $3,999.00. He told me that the problem with the word “only” was that it completely devalued the worth of a dollar. Years later, while walking down the street with a girlfriend, she stooped to the sidewalk to pick up a penny. “Why did you bother doing that?” I asked. “It’s only one cent.” As she pocketed the copper she shrugged and said “no one is above a penny.” That simple statement blew my mind! I still think of it every time I see change on the ground. For a woman who, truly, has so much, I had forever failed to see the value in a single penny in my pocket. I am grateful for a roof over my head, a shirt on my back, pants on my legs, shoes on my feet, and food in my fridge. I have a job to go to each day and money in my bank account. These are basics for many of us and absolute luxuries for some. I live in a city with exorbitant real estate prices, showy vehicles, and ostentatious lifestyles. Cash is king and image is everything. While that’s not necessarily the norm, it’s certainly not hard to find in Vancouver. I have admittedly indulged my whims from time to time over the years, but I’ve never considered myself to be much of a shopper. I will wear the same pair of jeans until they rip, and the only valuable pieces of jewelry I own are my wedding bands. Despite that I’m not much of a shopper, lately I can’t help but ask myself if the things I spend my money on reflect what I value. The answer is a resounding no. So what do I value? And what do I spend my money on? 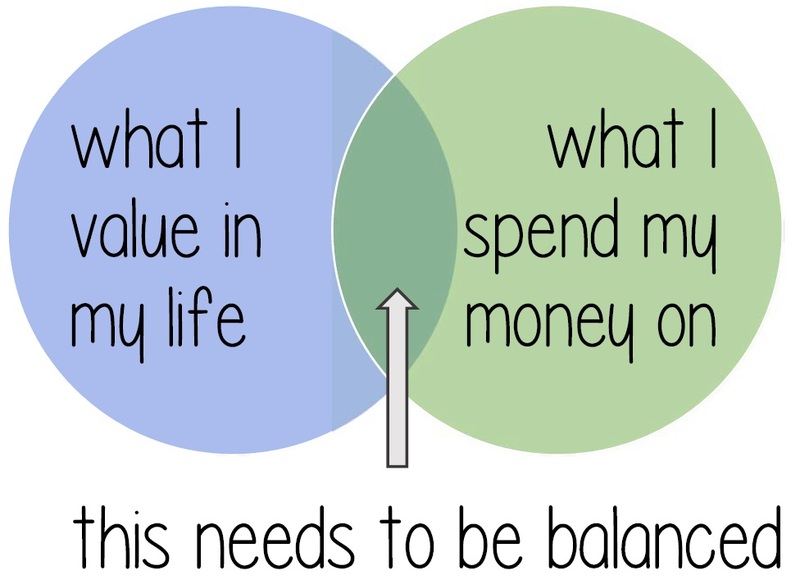 If I’m honest with myself, and I check my bank balance, I can quickly see that there’s a disconnect between my spending and my values. Getting a latté to go or painting my nails isn’t a bad thing, but the balance is off… way off. By reducing the number of lunches I ate out and my near-daily Starbucks trips, I was confident that I was being diligent enough to offset the cut in pay with my new job. While my intentions were noble, I made assumptions instead of taking a genuine look at how my habits were affecting the balance in my bank account. That’s $104.60 spent on coffee beans, soy milk, crispy rice cereal, seaweed, soy sauce, rice, yams, and cucumber. Each month. For fun. For convenience. That adds up to $1,255.20 each year. That’s not a number I can ignore when I consider it’s only one slice of the financial pie. Add to that random bottles of nail polish, shampoo, a cute top from Joe Fresh, a treat for my niece, or a new toy for Jordy, and I’m easily spending thousands every year on stuff. 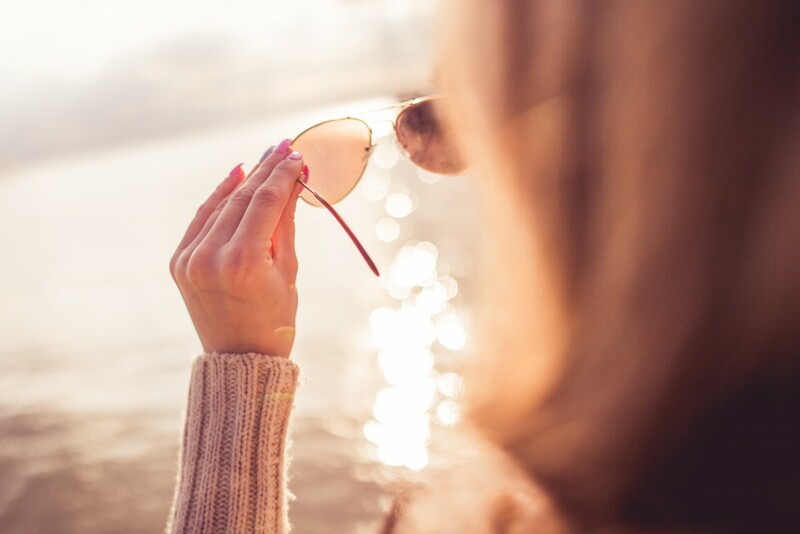 By taking a closer look at my spending habits and how they coincide with my values, it’s clear to me that this is the right time to take a new approach. 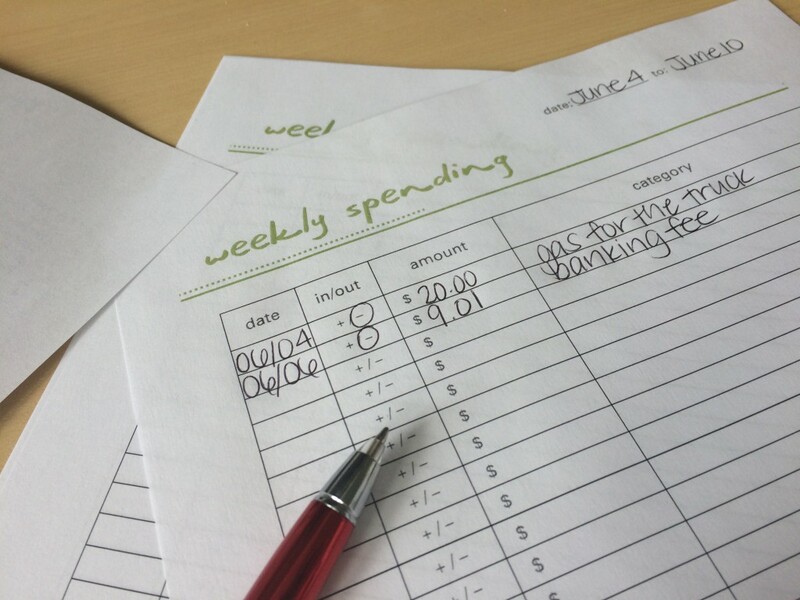 Mindful budgeting is a comprehensive method of looking at old habits with a new perspective. It’s not about balancing my books; it’s about overhauling my life. Years ago, I started following Cait Flanders on Twitter. She quickly became widely known as the “Blonde on A Budget” after she successfully paid off $30,000 in debt, banked money in savings, and traveled around North America by embarking on a two-year shopping ban. While Cait’s situation was different than mine is now, she subscribes to the same ideals that I do. Cait believes that all good things are wild and free. To that I say yes. So much yes. A large component of what helped Cait achieve such an accomplishment was adopting changes in her life. Because everyone has different needs, different goals, and different values, those changes will look different for each of us. My journey to financial wellness started on June 1st and I’ve decided to start with a six-month shopping ban. When Cait started her own journey, she took the bold step of committing to a year which soon turned into two years. Through her experiences, she developed the Mindful Budgeting program, created to guide others who seek financial wellness in their lives. Cait created both a day planner as well as PDF files to serve as guides and help track cashflow. I’m someone who learns in a hands-on way, so I find the PDF files she created to be particularly useful. My goal for this week is to keep these two expenses as my only expenditures. As I embark on my own journey of financial wellness through mindful budgeting, I want to use my blog as a platform to explore the different facets that I feel will work to inspire me and keep me motivated. In collaboration with Cait (and under her extremely wise and experienced guidance), over the coming weeks I’ll explore topics that I hope will also encourage you to more closely examine the financial-personal value balance in your own life. My intention behind this is to create a deeper sense of authenticity in my life. I want to walk the talk and ensure that the things I fill my life with aren’t things at all. This is a conscious and thoughtful choice. Mindful budgeting is more than just crunching numbers – it involves a conscientious and ongoing effort each and every day. Cait Flanders‘ two-year shopping ban ends on July 6, 2016! You can learn more about her and her financial journey over on her website. Her Mindful Budgeting program can be purchased online and you can start with her free budgeting template! Cait is also on Facebook, Twitter, and Instagram. We all can learn from these posts! Looking forward to the read. Thanks! Looking forward to your input. What an incredible first post in this new series, Keira! Thank you so much for sharing stories about your family and opening up about your past spending behaviours. And the venn diagram is perfect. If people taking nothing else from this post, they should save that to their desktops and look at it every time they look at their spending. Can’t wait to see what you learn about yourself over the next few months! Thanks, Cait! I’m excited about this journey and, just two weeks in, am already reaping the rewards of a more mindful approach to finance. I really, really love this post. I need to type up my own post about this for sure. I was doing well but then we bought a house and the ‘I need this for the house’ reasoning (psssh yeah right, good excuse) came up a million times. I need to get back on track. I’ll link to you and let you know when I post it Thanks for the inspiration! Hi Stephanie! It’s funny how easily we can get side-tracked by projects or by things we think we need. I’m glad to hear you got something out of this post and look forward to reading your post!